My American Original ’60s Stratocaster came with a very nice vintage-style case, but I prefer a gig bag for walking the 500m to guitar class. 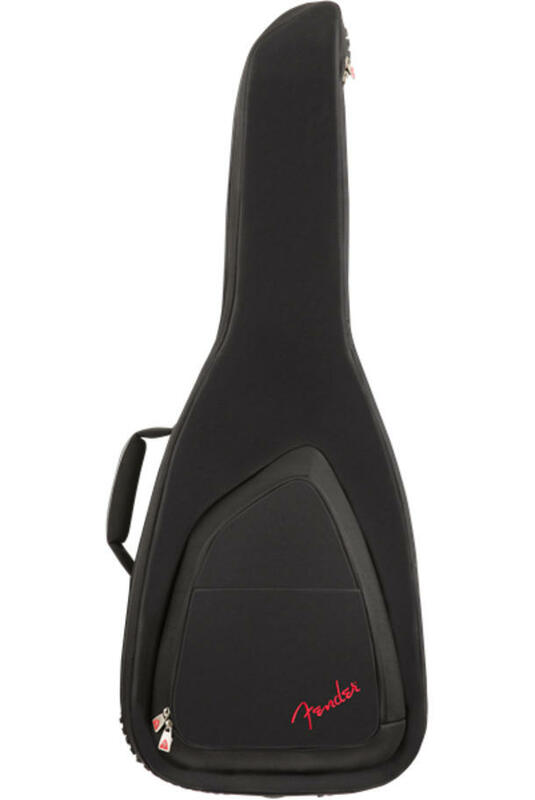 There are several brands out there, but Fender also sell gig bags with a nice set of features at a decent price. My choice fell on the FE620 model, which has 20mm of padding. Should you require even more protection, then there’s also a FE1225 model with 25mm of padding and 1200 Denier polyester. The gig bag comes with a number of very useful features. The bottom has thick rubber padding, the inside has a hole for the strap button. The shoulder straps can be removed and put into a zippered pocket. The straps themselves and the handle feature thick and comfortable padding. There’s a reasonably large zippered pocket up front with a business card holder and a couple of smaller pockets. The zippers appear to be of good quality and show the Fender “F”. I also really like the look of the bag with its small red Fender logo. So if you’re looking for a stylish, durable, practical and reasonably priced gig bag for your Fender guitar, this one is highly recommended. The same style is also available for a rang of other guitars and basses.